Above is my original house battery setup for my first year of Prius Travels. In case you have not been following my Prius Travels since 2014 you may not know what I am talking about. Living in my Prius for 4 months out of the year brings power requirements that are not best suited for the Prius 12 Volt system even though the Prius is a generator that resupplies power to the 12 Volt system from the hybrid high voltage battery through a DC to DC converter. When the high voltage battery gets low the Prius engine starts and generates power to replace what was taken from the high voltage battery. To do this the Prius ignition must be left on or what is called "Ready Mode". My biggest demand for power is my Engel compressor fridge that I recently posted about how well it operates and how little power it draws. My first year of Prius Travels I had two gel cells and found that although the two 12 volt 7 amp hour batteries got me though the night when March comes to the southwest it gets hot and the fridge runs more and I was stressing the 2 batteries. Note that Gel Cells are lead-acid batteries and if they say 7 ah you can only use half of that number so my first year I had 14 ah and only 7 ah were usable without killing the batteries. 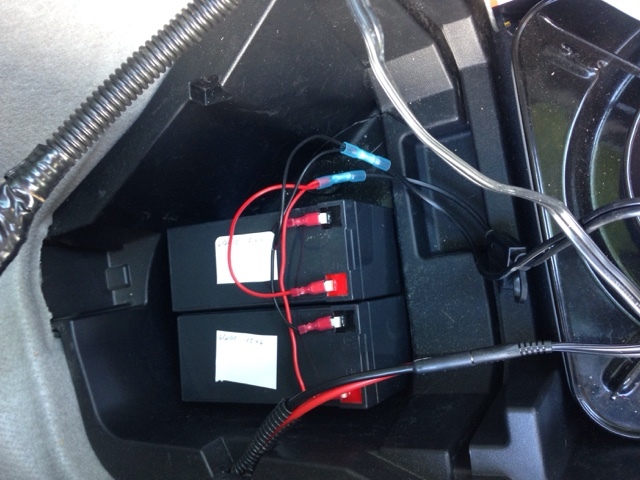 Above is my Prius house battery setup for year 2 of my Prius Travels. 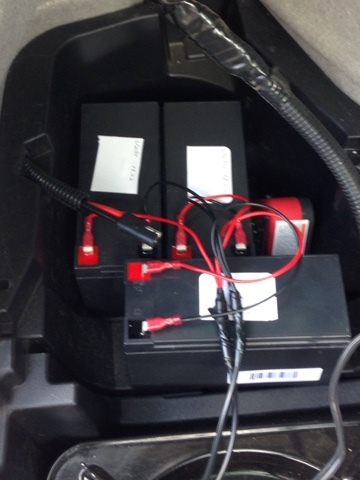 To solve this problem my 2nd year of Prius Travels I upgraded the gel cells to 8 amp hour batteries and added a third battery. (picture above) This gave me 24 amp hours but remember to divide in half and I had 12 amp hours of usable power. This was a large improvement in available power and solved my stressing the two batteries. Here is my post of upgrading my Prius House batteries. All was good in the world of house batteries for my Prius Travels, but I still had a couple of issues. - Gel Cells should be replaced each year before the next to prevent problems on the road. They cost about $20.00 each, which is not that bad. - In the afternoon after hiking or parked for some adventure I sometimes found myself with my batteries needing charge before I parked for the evening. Charging usually took 2-3 hours. Stealth parking is most important as you don't want the Prius turning on and off to draw attention, but I was also having to run the Prius in Ready Mode more than I cared to. - Lastly, I like to hike and when I hiked first thing in the morning before it gets too hot I may only have an hour or two at most to try to recharge the gel cell batteries and then run the fridge off of them while I am hiking. Again I found I was stressing the batteries. Above is the new LiFePo4 replacement battery for house batteries. I knew that the solution was Lithium battery, but I wanted to properly investigate the technology and find the right product before I would install it. First thing to understand is that Lithium is the name for a variety of battery technology or chemistries. The first lithium batteries that came out are Lithium Ion (Lion) and are the kind of battery in many devices and have the bad history with burning things up. 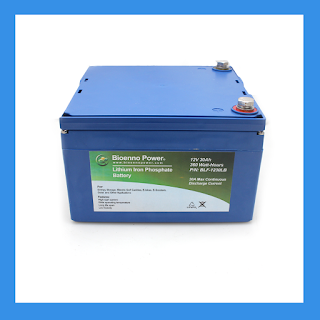 The technology I looked at for my house battery replacement and decided on was LiFePo4 (Lithium Iron Phosphate). It is much more stable and also has a lower operating temperature (down to 14 degrees), can be recharged many more times than Lion, and here is the big one, you can use up to 90% of the rated amp hours. You heard that right. With lead-acid technology you can only us 50% of the rated amp hours on the battery, but LiFePo4 can use up to 90%. Also, Lithium batteries weigh much less per amp hour. So many advantages. BUT! Not all LiFePo4 batteries are made the same by all manufacturers. I read a lot online and wrote technical questions to the companies and I selected to work with the Bioenno Power as they were the most responsive to my questions. I wanted my battery to be as high an amp hour battery that could reasonable fit in the space I have in the back of my Prius and be able to be fast charged. But wait! more choices. Companies are putting in circuitry to protect the batteries. 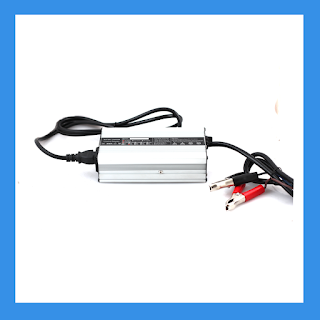 PCM or Protection Circuit Module is encapsulated in the battery pack to protect the battery from over charging or under charging the battery as well as other things. With a lead-acid battery if you go over the 50% mark of its capacity you risk damaging the battery. The PCM will shut off the LiFePo4 battery to protect it from being overdrawn. You can also get your battery with BMS or Battery Management System. BMS takes the individual cells that make up the battery and balances the individual cells after a charge to keep the cells from becoming a problem. I chose a battery that has the PCM and BMS for the most protection and longevity of usable life. Getting the BMS means though that I have to wait 30- minutes after a recharge to let the BMS to balance the cells before applying a load on the battery. I figured out I didn't mind this inconvenience. I settled on the battery in the picture above (Bioenno Power BLF-1230LB) that is 30 amp hours so that is 27 amp hours of usable power for the same size as the 3 8 amp hour 12 volt batteries that I was currently using that gave me only 12 amp hours of usable power. The spec for this battery listed that it could only be charged at 4 amp hours. This wasn't acceptable as it could take 8 hours to charge a fully depleted battery. No way! One of my emails discussed this with the company and with some research it was found that the PCM had been recently updated to allow for 10 amp charge rate. Yes! Above is the new LiFePo4 battery charger for my new house battery. I ordered their LiFePo4 10 amp charger (BPC-1510C) for $48.99. You must use a LiFePo4 battery charger on this battery! You can use battery chargers that pulse to remove sulfur deposits on lead-acid batteries like you can use on Lion drop in replacement batteries for lead-acid. We are dealing with a whole different technology. Above is my initial charge of the LiFePo4 battery and compatible charger. The first thing I did when the battery and charger arrived was to charge the battery as they are usually shipped at 30% of their charge. After fully charging the battery I plugged in my Engel fridge and let it run until the battery stopped as a test. The fridge ran 52 hours before the battery shut off. Excellent! The battery measured 1.1 volts but as soon as I disconnected the load the battery went to 12.1 volts. Above is my test measurement that I was delivering 10 amps to my new battery. After depleting my new battery I set out to fully charge it and it charged in 2 hours and 50 minutes. Excellent Again! Above you can see the charge rate of just under 10 amps. With everything tested out great the next step is the install the new battery and charger in the Prius removing the current gel cell batteries and multi-chemistry lead-acid charger I have to charge them. For those wondering about LiFePo4 and solar. Stay tuned. After my install blog on the new LiFePo4 battery I will be working on the solar connection to this system and will blog about that. For those interested in moving to Lithium battery technology please keep in mind the differences I mentioned above. Thanks for following. In the future I will be also covering DC to DC charging of LiFePo4, as well as a solar solution using a multi folding solar panel (like your solar panel) that you may find interesting. I'm waiting for more parts to arrive to evaluate these. Hi Brent I have the same setup thanks to your research. Can you recommend a good D.C. To D.C. Charger for your lithium battery even if charges at less than 10 amps ? Thanks!